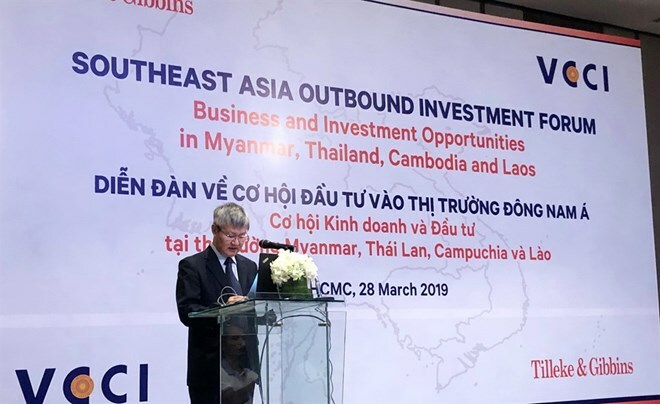 HCM City (VNA) - Vietnamese companies should further invest in and trade with Myanmar, Thailand, Laos, and Cambodia, which are members of the Association of Southeast Asian Nations, heard a forum in Ho Chi Minh City on March 28. Vietnam ran a trade deficit with Thailand because it imported a lot of machinery and equipment, raw materials for domestic production and automobiles, he said. In 2018, Thailand was the biggest source of automobiles for Vietnam, he added. As of last year, Thailand was the ninth largest investor in Vietnam out of 130 countries and territories with 10.5 billion USD in 528 projects. Laos ranked 52nd with 70 million USD, Cambodia was 56th with over 64 million USD and Myanmar, 99th with one project worth 800,000 USD. Vietnamese companies have invested in all these countries, including nearly 26 million USD in Thailand. They have invested over 3 billion USD in Cambodia to make the country among the five largest foreign investors in there. Vietnam was the seventh largest foreign investor in Myanmar with nearly 2 billion USD in 70 projects.